On September 24, 2015, the following article was published in the High Point Enterprise, written by the president of the High Point Community Foundation. As a result, one of our clients came in and made a $100 donation to our organization. He explained that he had read the article, thought about it and wanted to give back. We are grateful to both of them! There has been a seismic shift in the philanthropic landscape over the past ten years that I, coming from a corporate background, have enthusiastically embraced. It’s called “venture philanthropy,” and it is based upon the belief that charitable gifts should be made with the same expectation one might have investing in your own personal stock portfolio. All nonprofit organizations should have a sound business plan, a means to measure success and a return on your investment. Obviously you won’t be getting a stock dividend, but what you should see, and be able to measure, is a tangible impact. What this philosophy introduces is accountability and it’s a promise that any organization you support should be able to provide. Now, what if I told you that there is a nonprofit in our community who can promise you multiple million dollar dividends for your investment? Would you be interested in giving to an organization that provides this kind of returns? 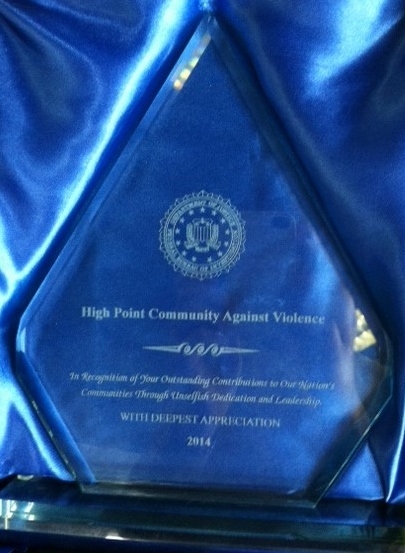 The organization I am talking about is High Point Community against Violence (HPCAV) and it may be the best “bang for your buck” in our city. HPCAV was established years ago by a group of ordinary citizens who partnered with our High Point Police Department in an effort to make their community a more safe and productive environment to live, raise a family and run a business. Since its inception, they have been identifying and “calling out” serious offenders, offering them a chance to mend their ways and, if they choose not to, sending them on long-term stints in federal prison. They are proactive in working with those recently released from prison by helping them with housing, food and job training, to acclimate them to society and keep them from reoffending. Most recently, HPCAV has started using a similar format to address domestic violence, which is not only more prevalent in this community than one would think, but also presents the highest risk to our police officers who respond to the calls. The key to their success in both of these formats is that the focus is rightfully directed upon the offender and they use the power of the courts to leverage reform or remove the offenders from the community. High Point Police Chief Marty Sumner not only endorses HPCAV, he can show you that this organization saves our High Point well over $14 million a year. It truly is the best deal in town, yet they have always struggled to raise money for their minimal budget. The Rev. Jim Summey, HPCAV’s executive director, is paid by the City of High Point and their annual budget is less than $100,000 a year. Every citizen, and certainly all of our local businesses, should be contributing to HPCAV annually. This program, which has been nationally and internationally recognized, deserves our admiration and financial support. I encourage each of you who read this article to consider just how much it is worth to you and your family to have a community that is safe from crime. There some things in life we do simply because they are right, true and just. HPCAV is one of these and if you would like to support them send your checks to High Point Community against Violence, 792 N. Main Street, High Point, NC 27262. PAUL LESSARD, a recipient of the Carnegie Hero Medal and a catalyst for the growth of community outreach programs, is president of the High Point Community Foundation.